First up, Shopbop are having an extra 25% off sale items, and some of the things I've featured in my Gift Guides are on sale! Just use code 'BONUS25', for 3 days only! 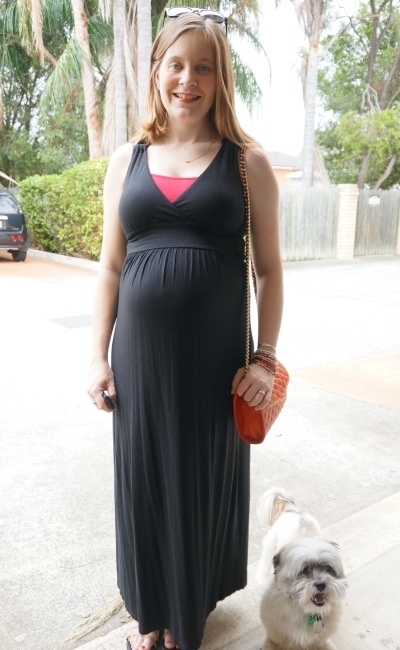 As I've mentioned before, the summer heat and humidity in Brisbane along with a growing baby bump has meant that I'm reaching for dresses as a nice comfortable and cool maternity option. And you can never go wrong with a maxi dress! This dress was one of my favourite maternity items in my last pregnancy, but it's taken me a while to get around to wearing it this time! While I did wear it a little post-pregnancy (it's a nursing dress too) it had been packed away with the rest of my maternity clothes and after unpacking it I had been waiting for the perfect occasion. I had been planning to wear it to toddler T's playgroup Christmas party for a while. Was the best thing to wear on such a hot day. The only thing I didn't like about this outfit was the belt - I really wished I'd worn a different one. With an inquisitive toddler who loves to pull out all my accessories I've had to move my belts up to the top of the wardrobe and I didn't have time to rummage through the box and grab the one I wanted as we were running late. Just went with the first one I saw. If you remember last time I wore this necklace it had a few more strands - the best feature about this necklace is that you can separate the pieces and wear it together or wear it separately. For less than $50 it's a great gift idea too! Last worn: Ray-ban Wyafarers (above), pink MEV Havana maxi dress, braided belt, Ikwetta sandals, purple Rebecca Minkoff mini MAB tote bag. Other ways to wear: maxi dress layered up for winter without a baby bump, braided belt and a printed shirt dress, Ikwetta sandals and skinny jeans, Rebecca Minkoff mini MAB tote bag and a boho printed dress. Plain doesn't have to mean boring - a block colour maxi dress is a beautifully simple outfit. Wore this for a busy day. We spent the morning braving the local Westfield gift shopping, crossing a few more gifts off our lists. Then I popped into the city to meet Rachel from A Nesting Nomad. It was great catching up with her and her hubby briefly while she was in the country! After having afternoon tea with them though I was still a bit full when we had dinner with the in-laws in the evening. 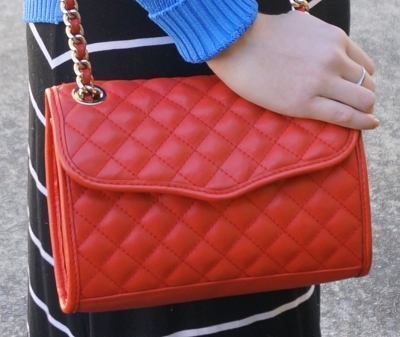 Red and black seemed like a nice colour combination, and it gave me an excuse to wear my quilted Rebecca Minkoff mini affair bag that hasn't been getting worn lately. Last worn: Ray-Ban Wayfarer, red singlet, black maxi dress, studded sandals, Rebecca Minkoff mini affair bag. Other ways to wear: red singlet and skinny jeans, black maxi dress layered for winter, studded sandals and a wrap dress, Rebecca Minkoff mini affair bag and a navy shirt dress. 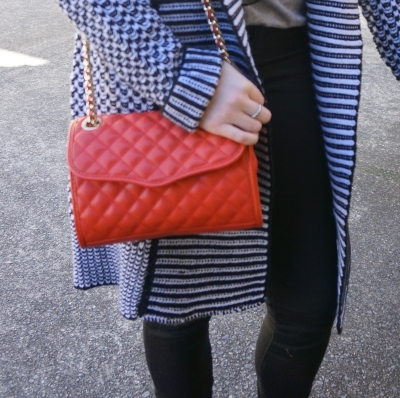 Linking up with Pleated Poppy, Fresh Fashion, Style Me Wednesday, Oh Hey Girl, Throwback Thursday, Fashion Files, Fun Fashion, Fabulous Friday. 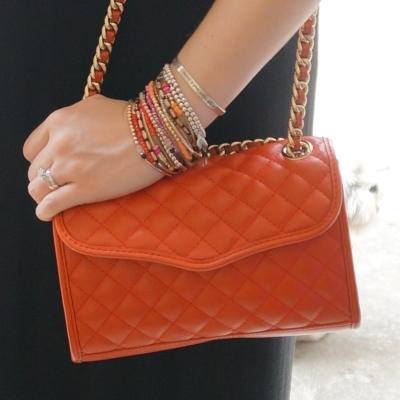 This post was created in partnership with Shopbop. Occasionally, Away From The Blue blog may receive vendor or brand sponsorships for mentioning their products or services. The views and opinions expressed on this blog are purely my own. 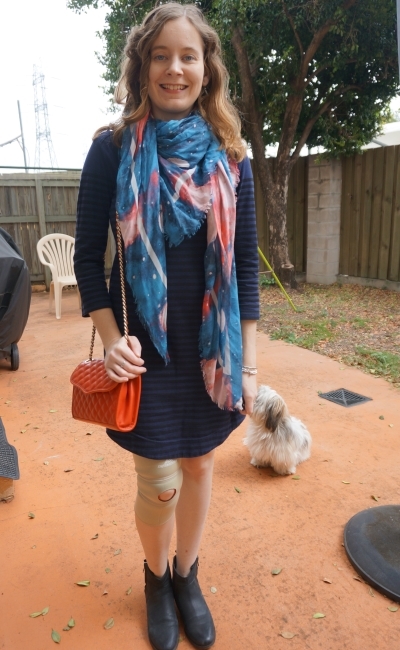 With the weather warming in Brisbane and some proper spring temperatures arriving, I took the chance to wear my favourite spring outfit combination - ankle boots and a dress. I added an extra layer to both outfits as it's not quite as warm as I'd like it to be yet. Yep, that chambray dress again! I did warn on instagram it was going to be the dress I wear over and over for spring/summer this year, haha! It's pretty much being worn as soon as it's washed and ironed. Decided to layer the blue tee under the dress for a little bit of extra warmth, as I wore a cardigan with it last time. I thought the red bag was a nice colourful option with the blue. Wore this on a busy day! Went grocery shopping, viewed some more houses, and had to rush Cooper to the emergency vets in the afternoon as he cut his paw. Poor pup had to wear a bandage and the cone of shame. Last worn: Ray-Ban Wayfarers, blue tee, chambray dress, Asos Chelsea ankle boots, Rebecca Minkoff mini affair bag. Other ways to wear: blue tee and a pencil skirt, chambray dress and a cardigan, Chelsea ankle boots and printed jeans, Rebecca Minkoff mini affair bag and a maxi skirt. This was pre-groom, with Cooper still wearing his fluffy winter coat as he sits in the background of my shots. I'm so behind with blogging what I wear that I often just pick a few photos that make sense to post together, even if I do post things a little out of order. In contrast to the outfit above, this was worn on a much quieter day. Spent the day with toddler T, running some errands in the morning. I had to do a little bit of driving around so I wore my knee bandage for some extra support. This dress hasn't been worn in a while! I didn't wear it as much this winter as I did when I first got it. It's great for winter layering as it's quite a thick fabric, and it has a dropped hem in the back so it's got extra coverage when running around after a toddler. Hopefully I'll get a few more wears out of it before Brisbane gets too warm. I actually ended up taking the scarf off for some of the day, as the dress kept me nice and cosy. 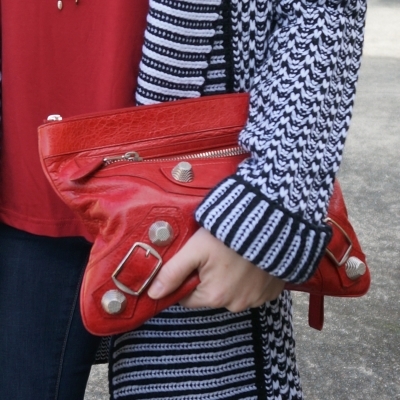 Last worn: stargazer scarf, navy stripe tee dress, black ankle boots, Rebecca Minkoff mini affair bag (above). Other ways to wear: stargazer scarf with a little red dress, navy stripe tee dress and Converse, ankle boots and a maxi skirt, Rebecca Minkoff mini affair bag and a printed dress. 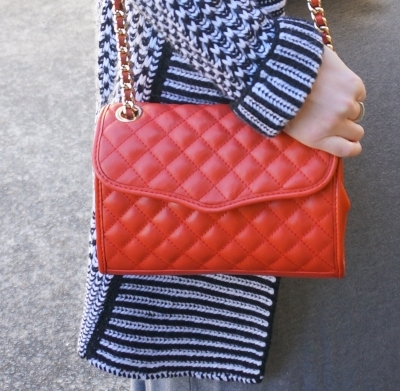 Linking up with Passion for Fashion, Flashback Fashion, Fab Favourites, The Ultimate Rabbit Hole. Since I got this striped wooly cardigan I've been wearing it a lot. While I like my leather jackets, a wash-and-wear option is better around baby. It's a nice piece to wear over jeans to keep me warm in winter. Thought I'd group these outfits together to post and show you two very similar ways to wear a cardigan. Lauren from Exploring My Style is so good at showing how you can wear the same outfit formula multiple times and yet make it look new each time! This post has one outfit formula (same cardigan, a printed scarf, skinny jeans and boots) and two slightly different outfits. This was such a simple but cosy outfit. Black, grey and a little bit of red. Had to run some errands in the morning, and a trip to the doctors for a checkup for baby T in the afternoon. I went with red accessories as the grey tee has a little red floral design on the pocket, you can see it clearer another time I've worn it (with a big baby belly!). Everything gets covered up with layers in the winter! As I mentioned in my review of the mini affair bag, I don't find this as easy to use as my mini MAC bags, but I'm trying to give it a chance and wear it a little more. I like the shape and the colour! Last worn: striped cardigan, red and black skull scarf, grey Marc Jacobs tee, skinny jeans, ankle boots, Rebecca Minkoff mini affair bag. Other ways to wear: cardigan with blue skinny jeans, skull scarf with polka dots, grey tee for a day at the beach, black skinny jeans with a pink top, ankle boots with a maxi skirt, red crossbody bag with blue and a maxi skirt. This looks like overkill, but I assure you all those layers were needed! Single digit temperatures are my least favourite part of winter, and so when the 'Antarctic Vortex' hit I pulled together all my winter woolies to keep me cosy for a morning running errands with baby, followed by playgroup. I was so thankful when we got to playgroup - they had the heater on warming up the room. While the toddlers did have fun playing with my scarf again, this time I didn't leave it behind! Last worn: striped cardi (above), Stella McCartney navy scarf, peach knit, skinny jeans, tan leather boots, LV Speedy bandouliere. Other ways to wear: striped cardi with a maxi skirt, heart print scarf with striped skirt, peach knit with leopard print, skinny jeans and a blazer, tan leather boots and a polka dot shift dress, LV Speedy bandouliere with dresses. Linking up with What I Wore, Whatcha Wearing Wednesday, Pleated Poppy, Wednesday Pants, Oh Hey Girl, Trendy Wednesday, Style Me Weekly, Fashion Files, Throwback Thursday, Fashion Should Be Fun, Weekend Link Up today. Although it's been quite a cold July in Brisbane, and we are getting cooler than normal winter temperatures, I've still been wearing dresses. No big secrets, just layering and wearing very cosy leggings and fleece lined tights! I try and wear my dresses year round, as much as I can. It resulted in these two very similar outfits, with a leather jacket, printed scarf, tall boots and and a simple dress. Last time I wore this jacket and dress together, it didn't stay clean for very long! Thankfully the jacket was able to be cleaned, and I was feeling brave enough to wear it around baby again. I wanted to recreate that entire outfit again, but decided at the last minute to try a different scarf and bag to add more colour. I really liked this version! I love this dress and boots together, and the jacket and scarf work so well. How nice is this scarf? My sister brought it back from Europe for me. She sent me a picture of this huge scarf display in the front of a store and asked if I wanted one, of course I said yes. She was very generous and got me two! We had a busy day with friends, exploring some of the hinterland and having lunch on tambourine mountain. I even had the chance to hold a snake. I was feeling pretty pleased with myself until she started to curl around my neck, I lost my cool a little then! We had an engagement party that evening, and I just wore the same thing. I did briefly consider wearing something else just for the party, but figured the dress was pretty enough and by the time we got home I hadn't left a lot of time to try find something else to wear. Did make time to change baby T into a little formal outfit though, he looked so cute. 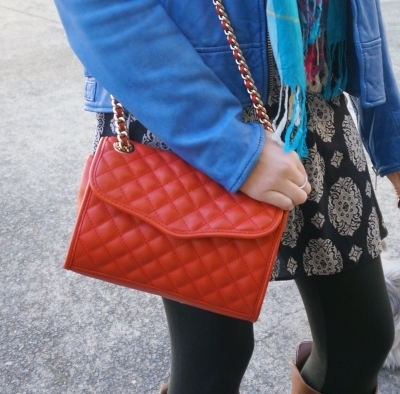 Last worn: cobalt blue leather jacket, Zara printed tunic dress, tan leather boots, Rebecca Minkoff quilted mini affair bag. First time I've worn the scarf. Other ways to wear: cobalt blue leather jacket with jeans, printed tunic dress in the second trimester, leather boots and jeans, red cross body bag with a maxi skirt and neutral outfit. A dress wasn't my first choice for this cold day, but as I was joining the basics check in style challenge on instagram and the theme for the day was dress, I thought I'd participate and wear something other than the jeans I've been wearing a lot lately. This outfit was wonderful, and I'd wear it again in an instant, but the day I wore it was pretty bad. Baby T and I had an appointment at our local clinic (one of those development check-ups / question sessions) and despite a rushed morning, I made it there with 10 minutes to spare. Only to find out we were a WEEK early! Oops. I have no idea why I thought the appointment was at a different date and time, I had written it down correctly on the calendar, but just didn't check it that morning. The day wasn't a total waste though, since we were out we caught up with my mum to have lunch. It was just such a bad start! Goes to show that even the worst mornings can turn into lovely days. 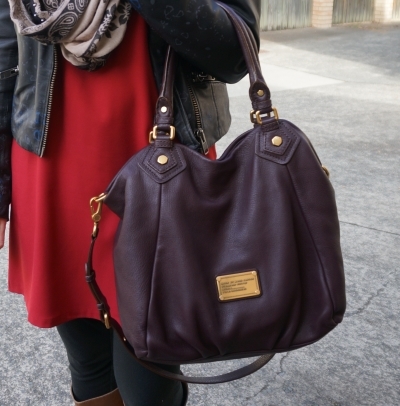 Last worn: printed leather jacket, Paisley print snood, red shift dress, tan boots (above), Marc by Marc Jacobs Fran bag. Other ways to wear: printed leather jacket with jeans, Paisley print snood in the office, shift dress with bare legs and ankle boots, tan boots (above), Marc by Marc Jacobs Fran bag in the third trimester. Linking up with Passion For Fashion, Friday Favourites, Fab Favourites, Casual Friday, Flashback Fashion Friday, Fashion Friday, The Ultimate Rabbit Hole, Shoe and Tell, Let It Shine, Hello Monday here and here today. Just in case you missed it, Beth from Almost Posh and I had a chat to a newspaper about #noBuyJuly15. You can see the article online here. It has lots of great tips about reducing impulse buys, saving, and trying to spend more mindfully. And now, what I've been wearing. I felt like I'd been wearing my skinny jeans a lot this winter, so I made more of an effort to wear my maxi skirts and get out of the denim rut. These two outfits were perfect for the days we had lined up with friends visiting from overseas. 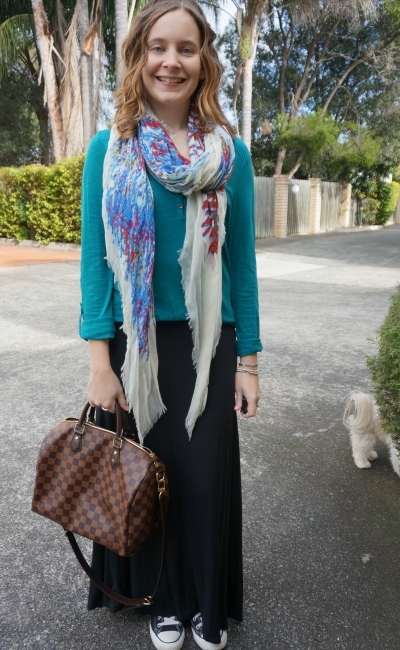 Maxi skirts and cardigans are such a cosy and comfortable combination. Apologies for the bin in the background of this shot! I was in a bit of a rush that morning. We were up early to travel down to NSW with our friends, and visit some great beaches and points of interest along the way. I was excited to wear my new Ikwetta sandals too! They are so pretty and perfect for the beach. You can see a better pic of my colourblock tee here when I was on a beach with baby, it's got a pink panel on the back. I have to say baby T coped so well with all the travel, it was a big day for him. I usually like to be home for his afternoon nap (he's down to just one nap a day) but he was still happy and smiley despite not really getting a big nap. 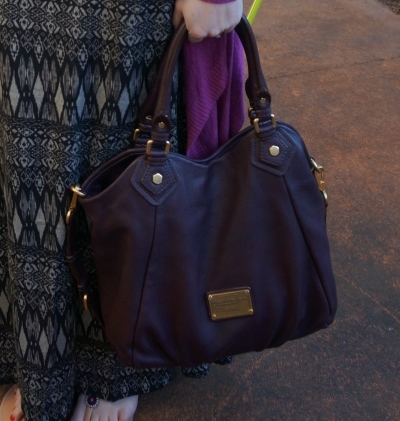 Last worn: purple cardi, colour block tee, printed maxi skirt,, Marc by Marc Jacobs Fran bag. First time I've worn the sandals. 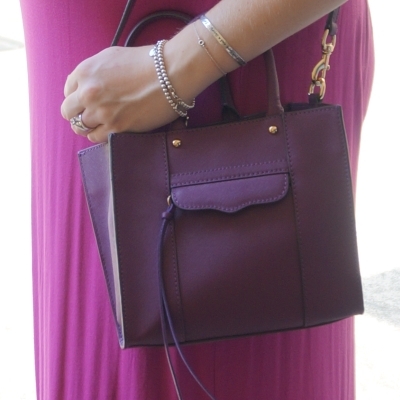 Other ways to wear: purple cardi and a tiny newborn baby, first time I wore this colour block tee, printed maxi skirt with grey and black, Marc by Marc Jacobs Fran bag at 40 weeks pregnant. I don't know what my hair was doing this day either! Had to get ready in a rush as didn't want to be late - we went to farewell our friends at the airport. We had coffee together and then after they flew away baby T and I went out for lunch with my mum. As above, a maxi skirt and cardigan seemed like a comfortable and cosy option - although ankle boots this time to keep my feet warm! I am glad I bought this tee. It had been hanging around in my cart at The Iconic for a while when it was on sale, and as I had an extra discount code off sale items and I was buying some boots too it was a good time to purchase. #noBuyJuly15 challenge was definitely needed, as I'm not managing to wear everything I buy before buying new things! 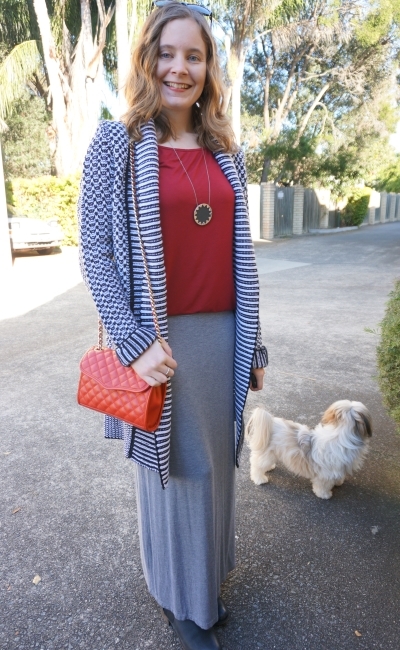 Last worn: striped cardigan, red tee, grey maxi skirt, black ankle boots, Rebecca Minkoff mini affair bag. Other ways to wear: striped cardigan and red tee together with jeans, grey maxi skirt with floral cami in spring, black ankle boots in the office, Rebecca Minkoff mini affair bag with printed maxi skirt. Linking up with Pleated Poppy, Style Me Weekly, Cappuccino and Fashion, Oh Hey Girl, Style Me Wednesday, Wednesday Pants, Trendy Wednesday Fashion Files, Thursday Favourites, Throwback Thursday, Fun Fashion Friday, Weekend Link Up today. These pictures were taken earlier in June, before the 'Antarctic Vortex' hit Australia. No chance of going jacket-less now, ha! 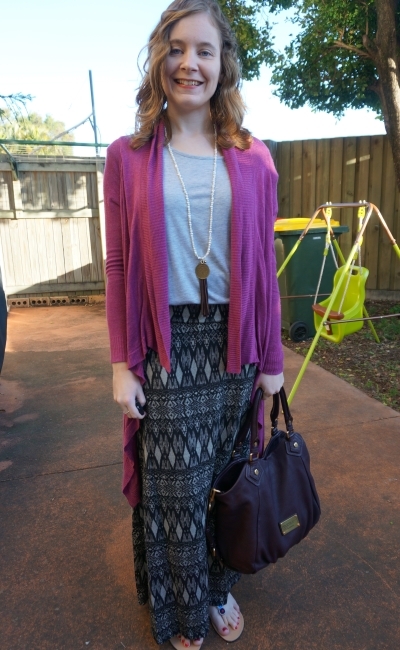 I'm just a little behind with blogging, so these are some different ways I've worn maxi skirts in winter with slightly more normal Queensland temperatures! 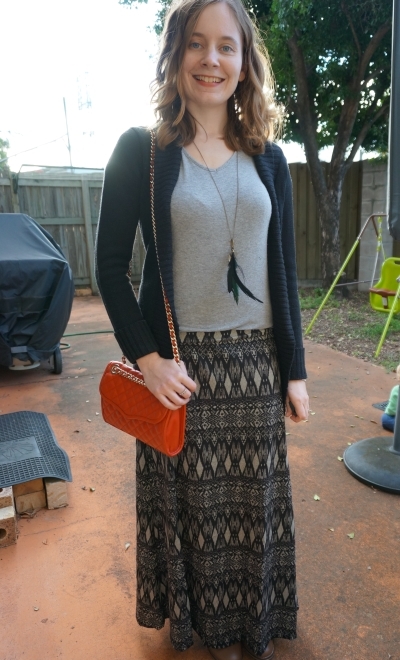 I'd been feeling a little like I'd been neglecting my maxi skirts lately so I made more of an effort to wear them. First, the Nordstrom Anniversary Sale is now open to the public! I mentioned it when it was open to card holders last week so you could add some things to your wishlist ready to purchase. Wanted to share the sale with you now it's open to everyone, even though I'm doing #noBuyJuly15 and won't be buying. Don't let my shopping ban stop you from picking up some bargains! Unless of course you are also doing #noBuyJuly15, in which case don't click on the links, think of how much you're saving by skipping the sale instead. I was actually quite cosy in this outfit - good for a quiet Sunday doing some shopping. We had a big night the evening before with friends so a relaxing day was welcome! 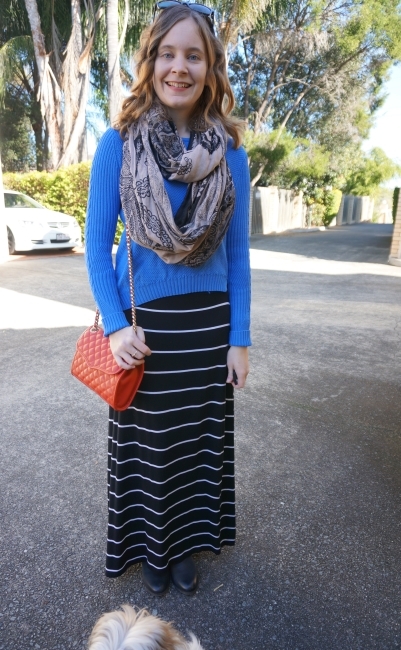 Did a little bit of print mixing with the paisley snood and the striped maxi skirt, and I thought the bright colours of the bag and jumper worked well together. 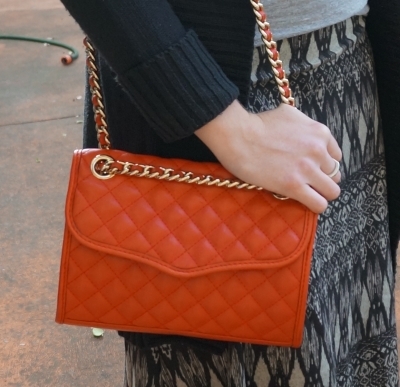 It's the second time I've worn both the jumper and the handbag, so I'll be doing purchase reviews for both. I don't know if it's the fact that I'm so behind with blogging or because I just bought so much in June, but I've really fallen behind with sharing what I wore immediately after buying it. Although I did manage to wear both these items in June, the same month I purchased them, it's just taken them a while to get onto the blog. I think #noBuyJuly15 will help me get on track and just wear and enjoy what I own for a while! I definitely need a break from shopping. Despite all the great sales at the moment! The handbag was another impulse buy! June really was the month of unnecessary purchases....I'd often thought about trying this style of Rebecca Minkoff bag, as I like my mini MAC bags, and I know this is similar in size. When I saw it on ebay, and then when it was relisted again...I decided to just go for it. It was a bargain! I'm still not sure it's a keeper in my bag collection - it's nice, but I do prefer the mini MAC style so this probably was not the best purchase. It's still going to get used, maybe just not as much as my other Rebecca Minkoff cross body bags. Last worn: Ray-Ban Wayfarers, paisley print snood, blue knit jumper, striped maxi skirt, black ankle boots, Rebecca Minkoff mini affair bag. Other ways to wear: snood in spring with chambray, jumper layered over a maxi dress, striped maxi skirt with purple, black ankle boots with denim, red bag with a neutral outfit. This outfit was not warm enough, even with the scarf! I spent a bit too much time in the morning trying to see if any other scarves looked nice before I settled on this combination - which I've worn before - so that when I did manage to get out the door with baby I hadn't spent any time thinking I'd need a jacket! Luckily we weren't outside for too long. 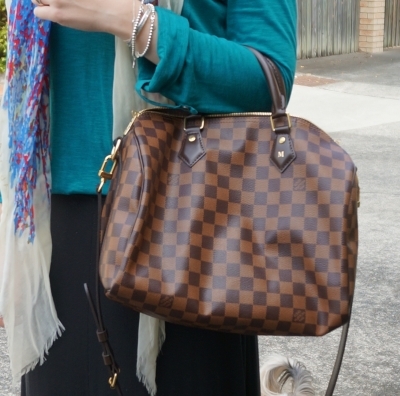 Last worn: printed scarf, teal henley, black jersey maxi skirt, Converse, Louis Vuitton Speedy bandouliere bag. 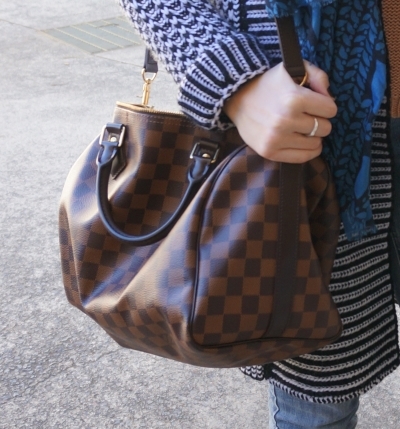 Other ways to wear: printed scarf with jeans and a blazer, teal henley with jeans, black maxi skirt with a printed tank, Converse with skinny jeans, Louis Vuitton Speedy bandouliere bag for the office. Linking up with Passion for Fashion, Friday Favourites, Casual Friday, Flashback Fashion, Favourite Fashion Friday, Fab Favourites, Fashion Friday, The Ultimate Rabbit Hole, Let It Shine, Shoe and Tell, Modest Monday today. Two casual and comfortable outfits for days with baby, featuring two new items that were given to me by Izabel London in return for showcasing them on the blog. I thought I'd include a review too, if you have been considering purchasing from them. I was intending to add a scarf to this outfit for some more colour, but baby T was being cranky that morning so I forgot all about it and went out the door without one. At least there was a little bit of colour with the bag, and all I was doing was going to the doctors with baby and getting groceries so I didn't have to be over-accessorised for errands. This skirt is one of the items I got from Izabel. It is so comfortable! I was a little unsure about ordering a maxi skirt from a new brand I'd never tried before, as I almost always have to have maxi lengths taken up at the tailor. Petite problems! This skirt has a fold-over waist detail though, so you can adjust the length to suit. I'm 5"2, and the skirt is the perfect length with the waist folded over all the way. 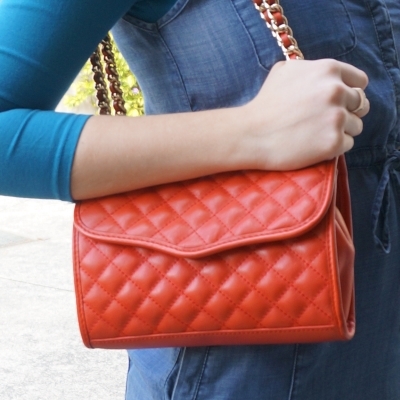 It doesn't look bulky around the waist even with the top section folded down. Last worn: black cardigan, grey tee. First time I've worn the skirt, bag and boots as they are all recent wardrobe additions. I bought a lot in June! Other ways to wear: black cardigan with jeans, grey tee in the third trimester. This cardigan is the best cardigan I have ever worn. I was showing hubby the new things I'd got and tried to explain to him just how awesome this cardigan is. It's part wool, so just as cosy and comfortable as a bathrobe, exactly what you need in winter. This was the perfect outfit for a day at home as hubby helped a friend move, and then an evening out. We were overdue a date night, it's been quite a while since the last one! I just took my things out of the baby bag and put them into the clutch for our dinner/movie date, as well as adding the dangly necklace. I like a 'SAHM uniform' that can be dressed up for date night just be adding some accessories. This was my first time visiting and ordering from Izabel London, so I thought I'd put a review together. (The company did not ask for this, this is just my thoughts). The big thing I like about their site is the fact that they share detailed measurements of the item and the model (like on the page for my waterfall cardigan). However, it's not on all items on their site so maybe it's a new thing they are rolling out. I was looking at some tunics but not all of them had the length listed so I didn't feel confident comparing them and decided to look at the other items instead, as I didn't want something too short. I'm pleased with the two things I did get though. The customer service at is great - I've been dealing with Sohny and I've always gotten quick responses to emails and we have regularly kept in touch over the ordering process. The shipping to Australia is good. It took 8 working days to arrive, so just under 2 weeks, and quicker than the estimated 10 working days specified on their website. I'd say it's similar to Asos standard shipping to Australia. They have an Australian returns address if you've ordered something that doesn't work out too. I didn't have to use it though, as I liked what I got style and fit-wise. Sizing is comparable to Australian sizing, I ordered my standard Australian size and everything fit like I expected. Overall, I'd recommend Izabel London. I think the products are great quality for the price, and I'm really happy with what I got. Plus if you're a fellow Aussie, a lot of their winter stock is on sale at the moment....I might be doing #noBuyJuly15 but there's no reason you can't have a browse. They ship worldwide too! Last worn: skinny jeans, black ankle boots, Balenciaga clutch. First time I've worn the tee and the cardigan as they are recent wardrobe additions. Other ways to wear: print mixing with skinny jeans, black ankle boots with a maxi dress, Balenciaga clutch with a printed maxi dress in summer. Linking up with Shoe and Tell, Let It Shine, Modest Monday, Style To Inspire, Mix It Monday, More Pieces of Me, Daily Express, On Trend Tuesday, Turning Heads, Reasons to Dress, Real Mom Style, Bless Her Heart, Confident Twosday today.